The rise of social media has changed the way the world does business. Although the Internet has always offered 24/7 availability of services, shopping and information, social networks offer more: personal connection, sharing, a sense of community – and trust. It’s no wonder that social media has come to play an ever greater role in real estate transactions, for good or ill, as the usual suspects in real estate scams find new ways to exploit the “friendly” nature of these sites. The large-scale Home Buyers Survey of 2012 found that over two thirds of the respondents had used the internet t o complete a real estate deal, and of those, about half said that social media had played an important part. For example, Twitter allows buyers to keep in touch with real estate agents and mortgage lenders in real time for virtually constant updates, and to connect buyers with sellers anywhere in the world. Others locate the perfect property through networks on Facebook or LinkedIn .as well as more niche-specific sites like iVillage. Social media platforms help with sharing information on experiences with a landlord, realty agent or other housing professional. It’s more surprising now that a dissatisfied consumer doesn’t post a flaming review of bad service or poor performance on all the usual sites, and message boards and forms let people come together to solve problems, answer questions and guide each other through the process. But social media is also a fertile ground for scammers. By their very nature, social media platforms rely on personal relationships. Users pass along links and information intended to help each other, and strangers become “friends’ based on mutual connections. Those are the strengths of social media and, like scammers everywhere know, they’re easily twisted. Real estate scams work though social media precisely because of relationship building. It’s easy for a con artist to identify and connect with a target and create a relationship that ends with fraud. Scam artists may also send “friends” to professional looking but fake websites promising a service or product. And, of course, once trust is established, the next step is to ask the target to send money or hand over personal information. 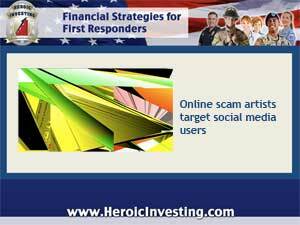 The US Securities and Exchange Commission has produced a series of online information pages aimed at groups including investors, seniors, and anyone else who might be susceptible to fraud through social media. Their advice includes the usual: verifying all websites offering financial services or offers demanding money up front and safeguarding personal information.